Heat gas or charcoal grill. In large bowl, mix olive oil and cumin. Add zucchini and tomatoes; sprinkle with thyme, rosemary and salt. Toss gently to coat. Place vegetables, cut sides up, on grill over medium-high heat. Cover grill; cook 5 minutes. Turn vegetables over; cook 5 minutes longer or until crisp-tender. Grilling is one of the simplest ways to prepare veggies. Just mix with a little olive oil and grill. The heat from the grill draws out the natural sugars in the vegetables, softening and mellowing them to perfect tenderness. Another bonus—you can change their flavor almost as quickly as you change your mind. 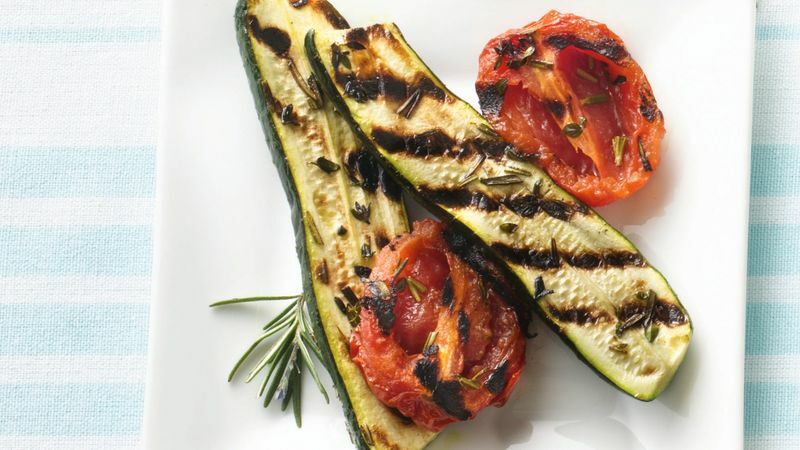 After grilling, sprinkle 1/4 cup grated Parmesan cheese over zucchini and tomatoes. Omit cumin, thyme and rosemary. Drizzle zucchini and tomatoes with olive oil; sprinkle with 2 medium cloves garlic, finely chopped. Grill as directed. Sprinkle with 1 tablespoon sliced fresh basil leaves, and drizzle with 2 teaspoons balsamic vinegar. Serve the vegetables on a pretty platter, and garnish with fresh rosemary sprigs.